In the recent Samsung Galaxy S10 leak, there was a picture that reveals a built-in cryptocurrency app developed by Samsung. 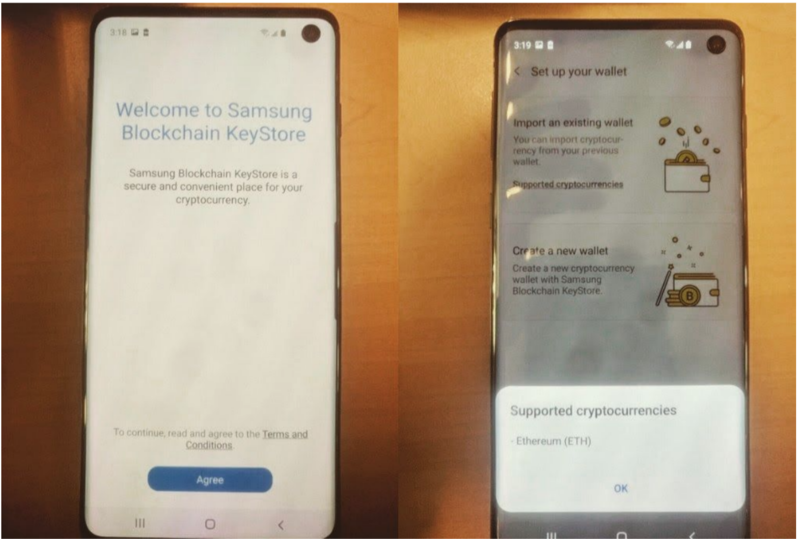 The leak reveals the Samsung Blockchain KeyStore app which appears to be a cold storage wallet for cryptocurrencies where the user’s wallet is stored anonymously on the blockchain network. The Blockchain KeyStore app may allow users to create a new cryptocurrency wallet or import an existing wallet. The app also appears to offer some unique features including a biometric authentication system through a fingerprint scan to further protect their wallet. The welcome page of the app describes Samsung Blockchain KeyStore as a secure and convenient place for your cryptocurrency. In December 2018 Samsung filed for three trademark applications with the European Union Intellectual Property Office. The filings show their plans for blockchain and cryptocurrency software apps built for smartphones. The three trademarks are named Blockchain KeyStore, Blockchain Core and Blockchain key box. The trademark documents didn’t reveal any additional details besides that the software application is indeed for mobile phone use. It’s exciting to see leading tech companies such as Samsung develop tools for cryptocurrency use, and adopt it into their top selling devices. The Samsung Galaxy S series has been one of the most popular set of Android devices every year for almost a decade. The Samsung Blockchain KeyStore app in the new Galaxy S10 smartphone will introduce cryptocurrency to billions of new potential users worldwide. Samsung has announced they will showcase the Galaxy S10, S10+ and S10 Lite on February 20, 2019. The phone is highly anticipated and is expected to release in March later this year. Another tech giant Sony (NYSE: SNE) is embracing cryptocurrency and building new products for the space. One of Sony Corporation’s subsidiaries, Sony CSL has previously announced​ that they developed a physical cryptocurrency hardware wallet using IC card technology and they also mentioned their plans to commercialize in the near future. There have been a number of companies developing new technology in the cryptocurrency industry helping make the use of crypto easier and more convenient. 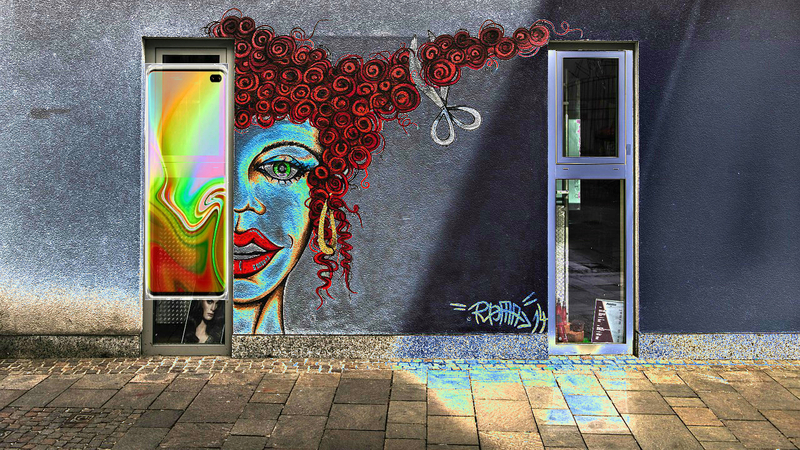 For example Bitplaza Inc recently developed a shopping app that allows users to spend Bitcoin in exchange for physical goods. The ​Bitplaza​ app, recently launched on the Apple App Store and Google Play, is now available to the public so that anyone around the world can make their daily purchases with Bitcoin instead of cash. Another great example is ​Coinstar​ making Bitcoin more accessible to the public by testing Bitcoin ATM functionality on their coins-to-cash kiosks located at grocery stores. As of now, the only Coinstar kiosks that allow customers to purchase Bitcoin are inside certain stores in California, Washington and Texas. Coinstar also stated that they will expand the Bitcoin ATM integration into more of their kiosks, depending on how well they perform at the current locations. The cryptocurrency industry has been growing at a rapid pace despite the 2018 bear market in cryptocurrency prices. 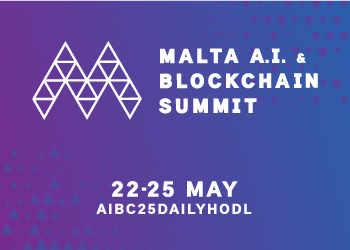 Companies are continuing to develop new technology and setting a foundation for cryptocurrency to thrive in the future. More and more local businesses and online websites continue to adopt Bitcoin as a method of payment. Companies that are dedicated to the crypto space are continuing to grow as well. Coinbase is projected to report around $1.3 billion in revenue for 2018, compared to $923 million in revenue for 2017 which saw a bullish market cycle in Bitcoin’s price. Bitcoin and the cryptocurrency industry overall have made more progress in 2018 than many years prior, although many investors argue that 2018 was a bad year for Bitcoin because of the decline in price. However, Bitcoin was originally designed to be used as a payment network and a global currency. 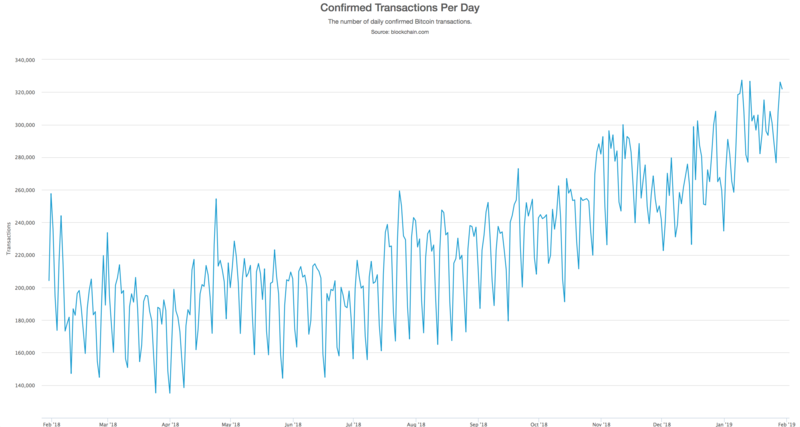 Bitcoin is doing better than ever as a payment network with around two million seamless transactions taking place every week, and that number is gradually increasing, according to data provided by ​Blockchain.com​. Those statistics are expected to grow continuously as new users join the Bitcoin network and as more businesses begin accepting Bitcoin payments. In addition, new companies are frequently entering the industry and developing technology for the space in efforts to make Bitcoin more useful and accessible to the public. Bitcoin appears to have a bright future ahead with ongoing progressive developments within the industry and a growing user base in all parts of the world.